Few weeks back we had reported platebeing member of iPhone Dev Team porting Android to iPhone 2G, we has also noted that android port to iPhone 3G & 3GS may not be as easy as iPhone 2G. Finally after couple of weeks of hard work platebeing and team has managed to port Android on iPhone 3G thought it is not as smooth as iPhone 2G port. 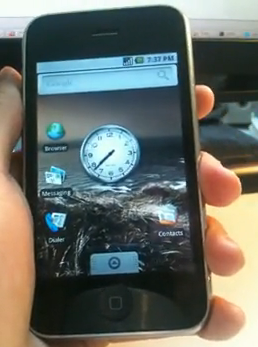 Android Multitouch is also working on iPhone 3G, see the below demo video of Android on iPhone 3G. The team has also improved Android for iPhone 2G port, fixing bugs, Wi-Fi driver has been fleshed out with all the Android-specific extensions, making it more stable and reliable. The option of selecting Android on boot menu is also added along with its icon. The binaries and installations instructions will be posted in couple of days.